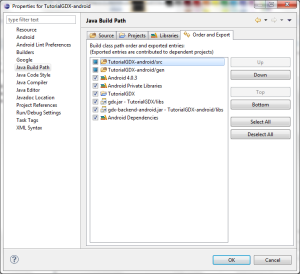 If you get “NoClassDefFoundErorr” when trying to run the project make sure to go the android projects properties > Java Build Path and make sure to tick the check box’s next to the dependencies your project uses. If you have got the Type-A-Number tutorial running your in a pretty good position, theres only a few changes needed to make it work with LibGDX. You can get the source code for this tutorial here. This tutorial assumes you are using Eclipse. Step 1 - Import BaseGameUtils and google_play_services_lib into your LibGDX project. 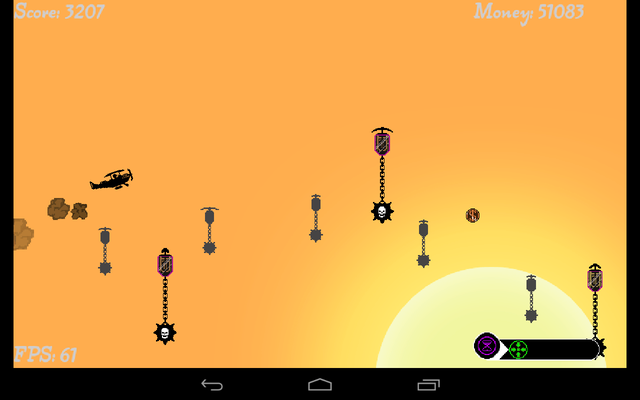 The BaseGameUtils project is located from the Google Play Game Services Sample Games located here. It also came with the Type-A-Number tutorial so you can just grab it from there too. To import the projects go to file>import>android>Existing Android Code into Workspace. Browse to the location of the lib your importing. The project should show up in the “Project to import” section. Make sure to click copy projects into workspace. Do this for both projects. Step 2 - Add google_play_services_lib as a dependency for BaseGameUtils. 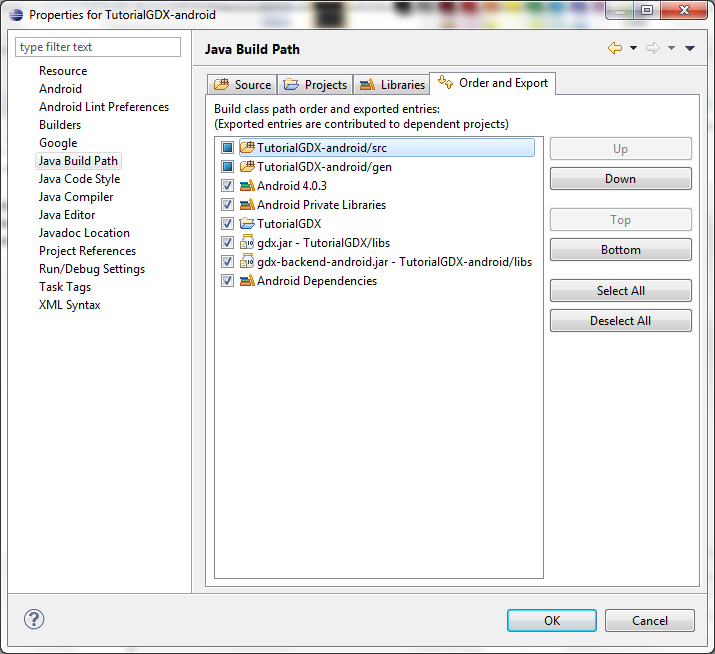 To do this right click BaseGameUtils and then click properties>Jave Build Path>Project>Add . In the popup box tick the google_player_services_lib and click ok. This should remove the errors BaseGameUtil was complaining about. If not try Project>Clean and hopefully that will help. Make sure BaseGameUtils is set to “isLibrary” to do this right click BaseGameUtils go to Properties>Android and tick the “isLibrary” box. Now add them to your Android project. Right click your Android project and go to Properties>Android in the library section click add and add both projects. They should appear in the pop up window after clicking add. 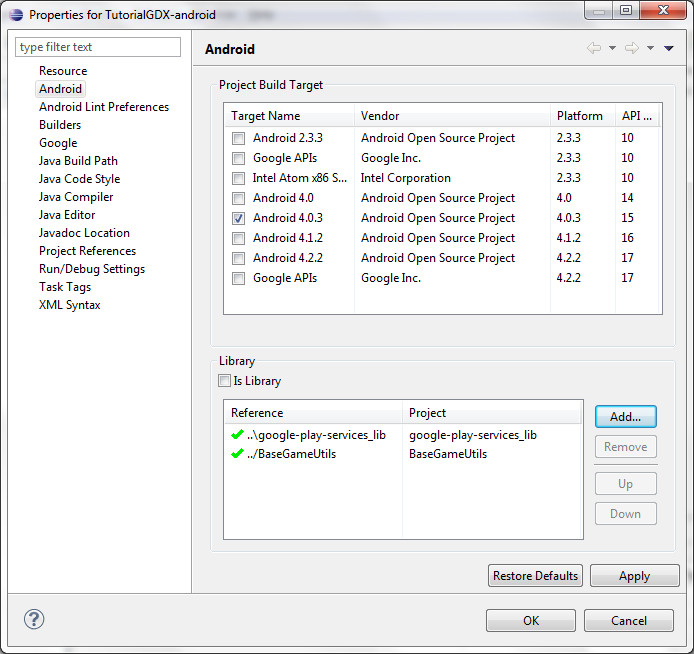 Right click your Android project and go to Properties>Java Build Path>Order and Export and make sure to tick the box next to ‘Android <your android version>’ and ‘Android Private Libraries’ as well as any others your project relies on (this is required for the newer Android Developer Tools). At this point the game should compile and deploy to a device without any errors. We can now begin working on the code. We need need to set-up some interfaces for platform specific code. We will pretty much just be doing what is discussed on this page. But to begin with we will setup a xml file to hold some important values needed by Google Play Services. In your Android project go to res>values and create a new xml file (right click values folder> new> Android XML File and call it ids.xml then click finish. Either click the add button and create a new String. When the string is created name it ’app_id’ and give it the value of your games ID from the Google developer page for your game or edit the file directory in the text editor by clicking the ‘ids.xml’ tab at the bottom. As you can see I store the interface in this class, what you do with it once its in the project is up to you. I also call the interfaces Login method straight away so the game attemps to Login when it starts. In practice this probably isn’t a good idea. But for testing its fine. 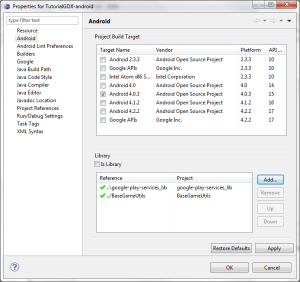 Step 8 - Change MainActivity in your android project to implement GoogleInterface. If your getting an error with leaderBoardID you need to add it to your strings.xml file which is located in your Android project at res>values>strings.xml. The value for leaderBoardID should be the value of a leader board from your Google Developers page if you have made a leaderboard for the project. At this point running the game should prompt you to choose a google account to log in with. If that actually happened, I’m surprised! If it didn’t, I probably forgot something or the tutorial needs to be more clear, so please contact me where you have got lost or what’s going wrong and I will try to help! The graphics are being created by Liam Bower. 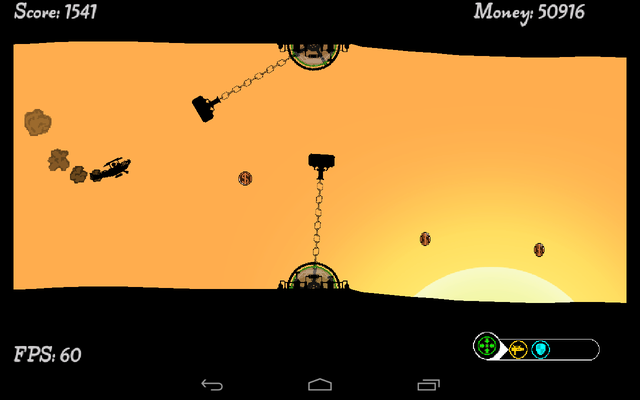 The game is basically a helicopter style game with extra features such as different areas, power ups and a shop. We hope to have it finished pretty soon, although it has already taken much longer than originally anticipated. The results of this method are good, however it is probably more process intensive than it needs to be, and finding ways to optimize it will be something I will need to look into. One solution could be generating ‘height map’ like structures, and then using the triangles to draw from the edge of the screen to the tip point of the map. 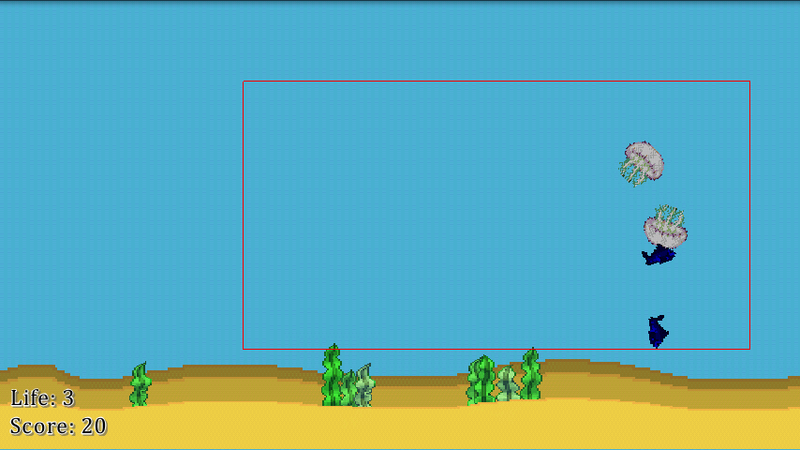 This will remove the drawing of all the boxes under the triangles as the triangles would create the entire terrain. 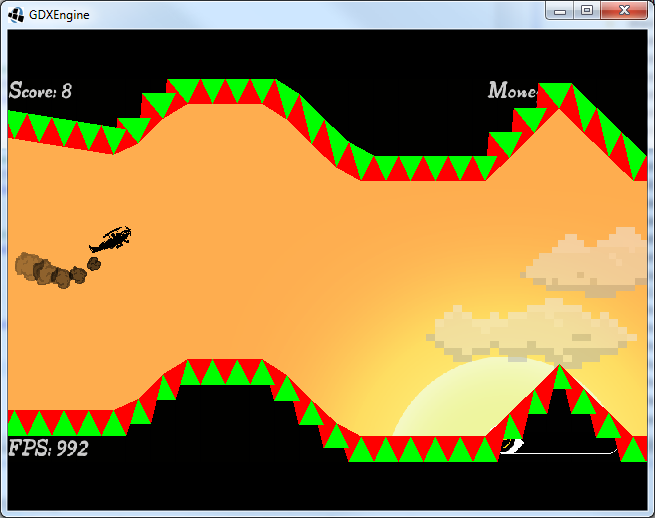 Generating the terrain in wider sections will lower the number of triangles being drawn at once too. Firstly, I started a 12 month work placement at Canalside Studios back in September which has made me much more busy. 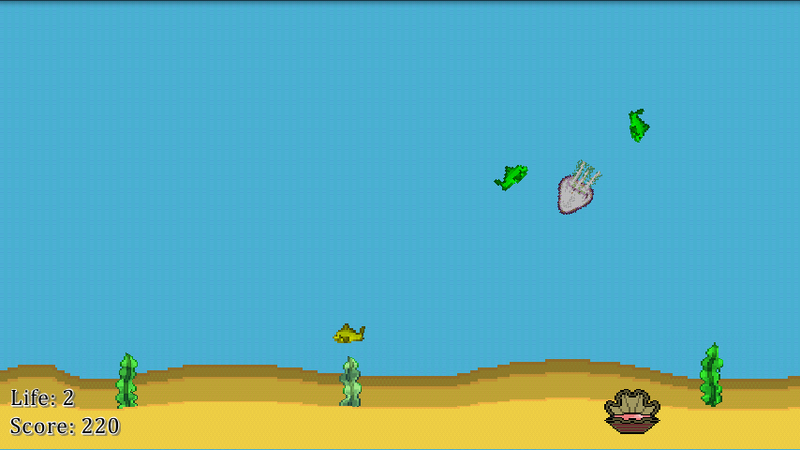 I am currently working as part of a small team at the studio creating a mobile game using Marmalade. Although I have only been at the studio a short period, less than 3 months, I have already learnt a great deal. One of the areas I have learnt the most in so far is C++, as Marmalade is a cross platform SDK written in C++. The game is still in pretty early stages but so far the team seems pretty excited about what we’re creating! Hopefully it’ll turn out good. 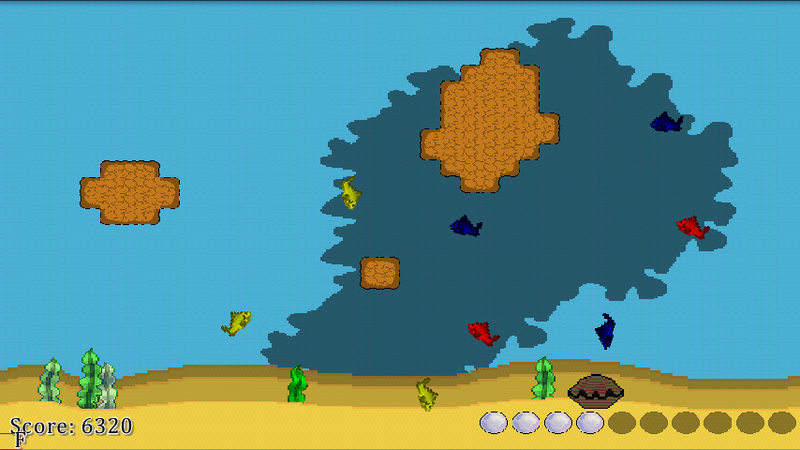 This does unfortunately mean I have stopped working on the Fish Game I was making in LibGDX. After learning about basic game engine structure working at the studio, it made me realize what a complete mess the code was. Also, the game just wasn’t very fun! Once I had the grid, I ported the code from a flash demo I made that created cave/caverns using cellular automata. From there I just spent some time playing around with the rules. The main rules are cells with less than 3 neighbour cells that are ‘alive’ will die that pass, and cells surrounded by 5 or more living cells become ‘alive’ if they aren’t already alive. I do 5 iterations of these rules before doing a few special rule sets at the end to help clean up situations such as 1*1 single living cells and to shape the coral a little better. Once created each cell auto tiles by working out how many cells it is surrounded by and in what positions to determine which tile to use for itself. I use two layers of coral, one for the foreground that when touched ‘hurts’ the player, and the other is a background layer just for aesthetics. The background layer uses bigger size cells, so has less cells in its grid. As such I fill the gird with more noise to start, but besides that it generates using the same rules as the foreground cells, and just auto tiles using a different tile set. I am pretty pleased with the results of the generation, and have additional rules in place to make levels generate with more coral in later levels to make them harder as you progress, which I feel works pretty well. This week I am planning to think about the design of the game more, as I feel it is more tedious to play than it is fun to play, so I will try and think of ways to make the game more fun! So its Friday of week two, so I really can’t put off doing a blog now if I want to stick to a blog a week! 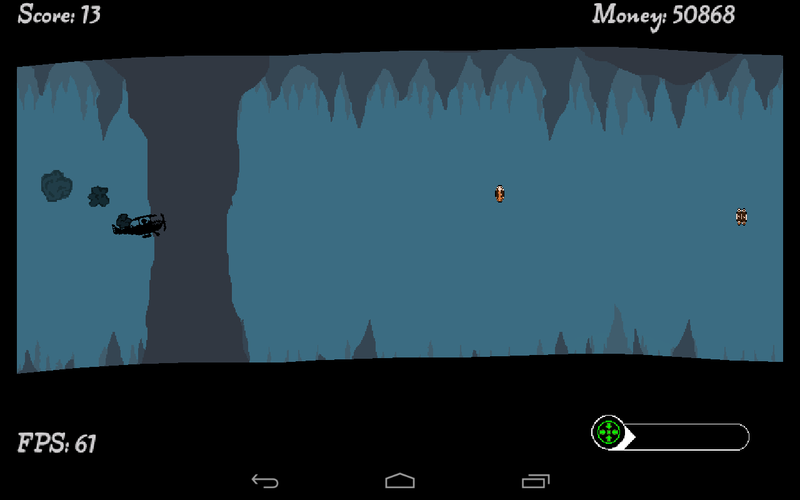 This week I have implemented volcanoes into the game. Lets take a look! 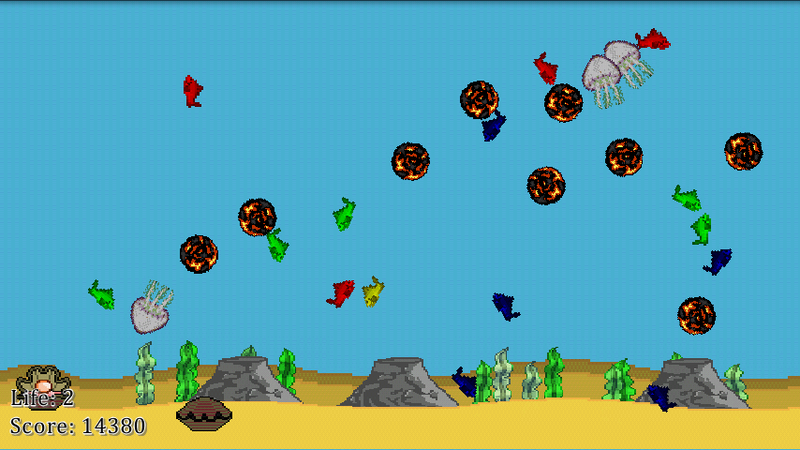 Lava Balls work pretty similar to Jelly Fish. If your finger ‘touches’ one you get hurt. The main difference is the movement. Jelly Fish swim around minding there own business much like fish (in fact exactly the same as fish). 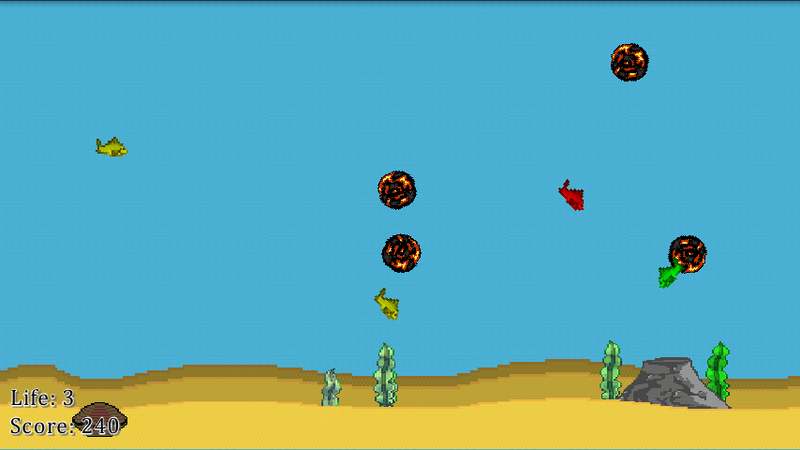 Lava Balls however get launched out of a volcano when it erupts and shoots upwards. 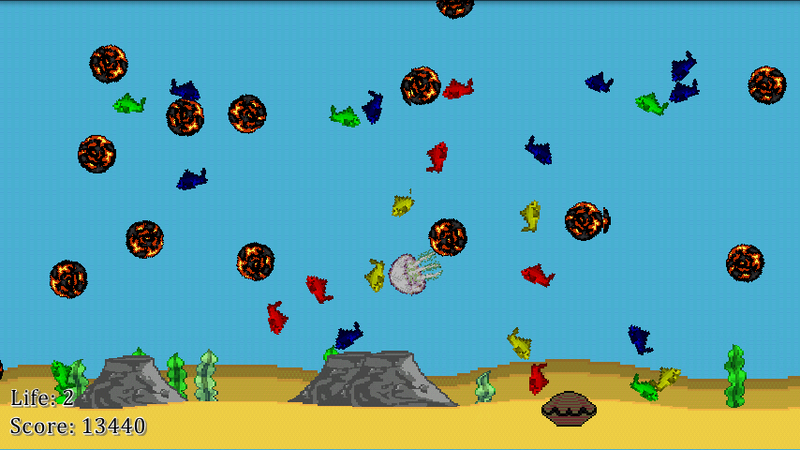 They then slowly lose momentum and provided the initial eruption wasn’t so powerful they got launched off the top of the screen, they will then fall back down to the sea bed. Although functioning well on a basic level, Volcanoes and Lava Balls could still do with some polishing (steam particle coming out of volcano before an eruption). 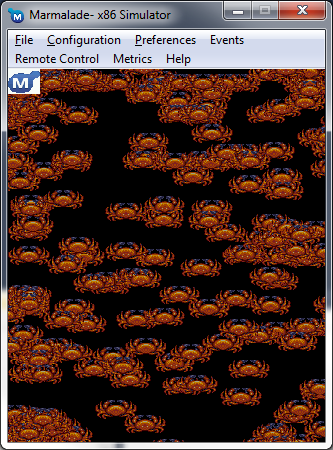 One small issue I am having is the Lava Ball sprite is stretched on some screens. This is peculiar as I haven’t had this problem with any of the other sprites, and it is using the exact same code (copy and paste!). I hope to mess around with them a bit longer to try and sort the problem out. 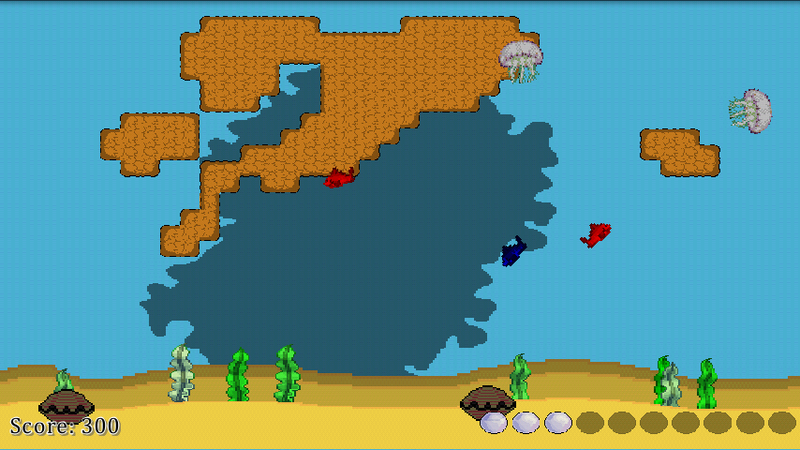 Anyway, that is all I managed to do last week, this week I hope to work on some procedurally generated coral reef! So after putting it off for some time I’ve decided I should really start blogging. The main focus of this blog will be on the development of projects I am working on, so lets begin! Most the art is ‘borrowed’ at the moment, it will all be replaced with unique art at some point before release, but for now I am focusing on the development to ensure the game does actually get released! 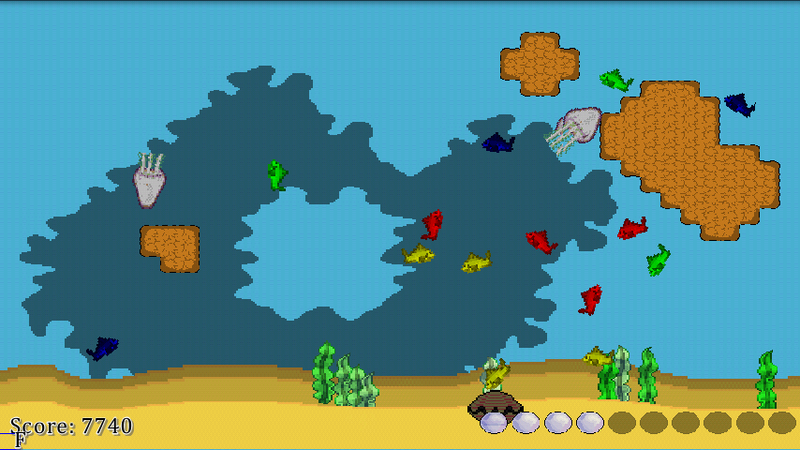 Recently in development I was having trouble with the game crashing after clearing about 30 ‘waves’ of fish. It turns out it was actually the seaweed that was causing the crash. At the moment the seaweed is the only animated object in the game, and each seaweed object loads all the textures in the animation (bad idea really!). After each ‘wave’ the sea bed would generate a new floor with new seaweed objects in new positions. It seems that after 30 waves there were so many seaweed textures loaded the game crashed. 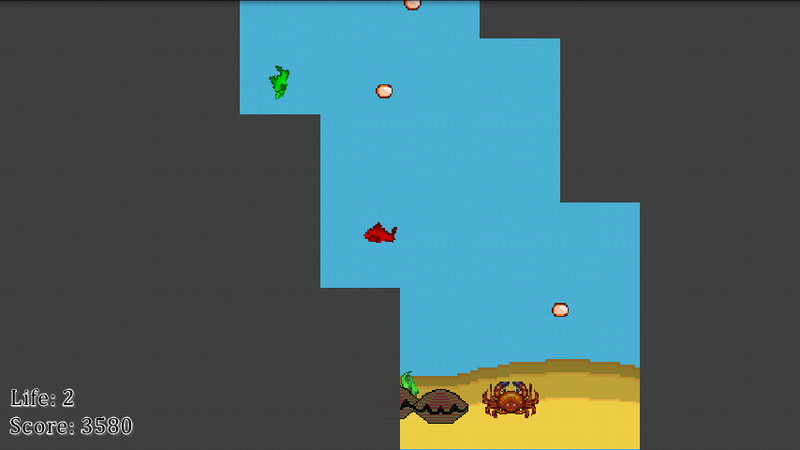 I have fixed the issue by pooling seaweed objects (you can only ever see like 10 on the screen so no more than 10 need to be created) however I can probably further optimise the seaweeds and improve performance by loading the textures in the animation once, and just reusing it when drawing all the seaweeds, instead of having it loaded into memory 10 times which I am doing at the moment. So next I’m going to do a little re-organisation and cleaning up of the code base and then start working on volcanoes! The plan is a blog a week, so shout at me if I don’t do that!